A number of groups have joined forces with former Canadian Defence Minister Paul Hellyer in urging Parliament to hold public hearings on 'exopolitics' - or relations with extraterrestrials (ETs). Click here to watch Canada's former Minister of National Defense, Hon. Paul Hellyer's historic speech at the Toronto Exopolitics Conference in September 2005. Paul Hellyer, a former Minister of Defence in the Pearson Government, has announced his belief that UFOs are real and that the US is developing weapons systems for space which are to be used against alien craft entering earth's airspace. He voiced his opinions at the recent "2005 Toronto Exopolitics Symposium". Exopolitics is a new term used to describe the study of the politics of extraterrestrial contact. It is usually discussed in a context which assumes that enough evidence exists from existing UFO reports to conclude that some UFOs are craft that are piloted by beings originating from other planets and solar systems. Hellyer's comments received some coverage in the national media and stirred some interest and reaction from the public, mostly from those who have some interest in UFOs. Paul Hellyer was first elected as a Liberal from Toronto's Davenport riding in 1949. He was, at that time, the youngest MP to serve in Canada's parliament. He served as a parliamentary assistant to the Minister of National Defence and then went on to serve as the Associate Minister of Defence in the cabinet of Prime Minister Louis Saint-Laurent. He later served as Minister of National Defence in Prime Minister Pearson's cabinet in the mid 1960s and served as Minister of Transport in the cabinet of Prime Minister Trudeau. His most notable and controversial achievement was the integration and unification of Canada's army, navy and air forces into a single organization, the Canadian Forces. At the time, unification sparked considerable negative reaction from many members of the armed forces who objected to the manner in which military traditions such as separate and unique uniforms were discarded. After resigning from cabinet in a dispute with Trudeau, Hellyer sat as an independent and later formed a political party, the Action Canada Party, before crossing to join the Progressive Conservative Party. He failed in a run for the leadership of the PCs before leaving that party to rejoin the Liberals where he failed to secure a nomination. He later went on to form the Canadian Action Party in 1995. In terms of influence, the peak of his political career was probably in his earlier years when he served as a cabinet minister. His political views gravitated towards concerns about the threats to Canada's sovereignty posed by US political and economic influence in Canadian affairs. In recent years he is one of many prominent Canadians who have opposed Canadian support and participation in the US National Missile Defense program (NMD) and supported calls for a ban on weapons in space. It is through these contacts that he began to encounter the views of persons who believe that the US is planning space based weapons systems to be deployed against ET controlled vehicles entering earth's atmosphere from space. Paul Hellyer states that his beliefs in ET visitation do not relate back to insider knowledge obtained from his time spent as Minister of National Defence from 1963 to 1967. At that time he was largely consumed by other pressing public policy priorities and paid scant attention to high profile UFO encounters like the Shag Harbour, Nova Scotia incident in October 1967 or the Falcon Lake, Manitoba encounter in May 1967 where Stephen Mickalak received chest burns from a hovering UFO. Hellyer states his recent interest in UFOs was prompted by viewing Peter Jennings TV documentary on the topic. He later read "The Day After Roswell" by Col. Philip J. Corso, who once served as the head of the Foreign Technology Desk at the US Army's Research and Development department. In his book, Corso asserts that parts from a crashed alien vehicle were recovered from the July 1947 incident at Roswell, New Mexico which the US Army Air Force later explained as a weather balloon. Corso states some parts were transferred to a "file cabinet" at the Pentagon where they were used to guide developments in several technologies such as integrated circuits, night vision systems and lasers. Author of controversial book, "The Day After Roswell"
Many UFOlogists dispute conclusions that a UFO crashed at Roswell, New Mexico in 1947. Others do not believe Corso's specific allegations in his book relating to his role in applying ET derived technologies from this alleged crashed UFO to practical recent technological innovations. Stanton Friedman is a nuclear physicist who investigated Roswell and has books about the Roswell crash and MJ-12, the alleged top secret US committee created to study UFOs. Friedman, who now resides in New Brunswick, casts doubts on Corso's claims that he was the central figure responsible for seeding technology derived from wreckage taken from the ET spaceship which (allegedly) crashed at Roswell. In response to those who question how he came to believe the contents of this specific book, Hellyer states that he personally spoke with an unnamed US General who assured him that all of this and more was true. For some UFOlogists, Hellyer's foray into Exopolitics was not welcomed. The very notion of a study of the politics of extraterrestrial contact is hotly contested by many as they feel that UFOlogists must focus on the scientific investigation of UFO phenomena. Some reason that there is insufficient evidence to conclude that some UFOs may be vehicles incorporating technology far beyond those developed by earth civilization. The reality is that all of this is mostly a debate happening amongst a very small group of researchers and interested persons that has little measurable impact on the information shared through mass media outlets like television, radio and newspapers. There are few celebrities of any sort who want to risk their profile and public following to publicly state their views on the possible importance posed by UFO encounters, especially if some have extraterrestrial origins. Few politicians have been brave enough to face the ridicule posed by suggesting there might be anything worthwhile to gain through the study of UFOs. President Carter and President Reagan both spoke about personal UFO encounters but made few other public statements about the policy implications posed by these events. It might be expected that any viewpoint supporting the possible reality of ET visitation to the planet might be welcomed by those UFOlogist's who claim to be open to this possibility. But due to deep divisions between some UFOlogists and persons who advance the study of exopolitics, this has not been the case. As an example, Paul Hellyer's statements to the Exopolitics conference in Toronto were mocked and ridiculed by filmmaker Paul Kimball of Redstar Films based in Halifax, Nova Scotia. Kimball's views are of some significance as he is one of the few Canadians to have an interest and financial stake in producing documentary films on UFO related topics. His documentaries include "Stanton T. Friedman IS Real" and "Do You Believe in Majic?" He is currently working on film documentaries on cattle mutilations and the ten best UFO cases. "Because if anyone in Canada would have known about the Cosmic Watergate, and UFO secrets, and alien bases, etc. etc., it would have been the Minister of National Defence in the mid 1960s." This statement assumes that the Minister of National Defence is privy to all secrets contained within the Department of National Defence. It further assumes that any questions concerning the security implications of UFO incursions into Canadian air space would require a continuing policy review from the Minister of National Defence. What if Canadian policy on the security implications of UFOs was already determined by our participation in NORAD continental air defence, established back in the early 1950s? There is documentation to suggest that there was considerable concern about the possible security risks posed by UFOs during the early post World War 2 time period. The US Air Force initiated several studies of UFOs to evaluate the potential threat to national security. It was initially thought that the UFOs might be secret weapons produced by Germany or the Soviet Union. It was later determined that the UFOs were not foreign developed weapons systems and one study in the US Air Force concluded some UFOs possibly had an "interplanetary origin". 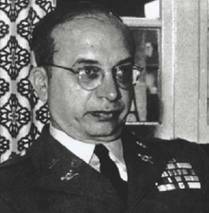 In his UFO books, Major Donald Keyhoe documented the struggle in the US Air Force between those who favoured open sharing and disclosure of UFO information with the public and "the silence group" who feared that the public was not prepared for this information and wanted to keep all unsolved reports secret. The CIA sponsored Robertson Panel Report in 1953 appears to have set the policy direction for US government agencies including intelligence and military agencies regarding UFOs. It suggested that the credible UFO reports should be debunked, that only reports of easily explainable occurrences of meteors and such should be publicized, and that the activities of civilian UFO study groups should be monitored. It was concluded that there was no evidence that UFOs posed a specific security threat to the US, but that the reporting of UFOs might trigger the mass hysteria that was observed following the radio broadcast of "The War of the Worlds". The panel felt that the mass media could be used to discredit UFO sightings. It was also concluded that there was no evidence that UFOs were actually advanced vehicles piloted by beings from other planets. The official study of UFOs by the US Air Force did continue through Project Blue Book until the 1968 University of Colorado "Condon Committee Report" advised that Blue Book should be shutdown as there was nothing further to be gained from the study of UFOs. But even though Project Blue Book continued through the 1950s to the late 1960s, it was largely ineffectual in conducting serious research into UFOs and its direction was largely to abide by the policy framework established through the Robertson Panel Report. The more serious and contentious question is whether some persons connected with the study of UFOs decided to continue studies in a compartmentalized and secret organization and program. Those who support this view refer to documentation suggesting such a group, possibly called MJ-12, has been operating in the US since the late 1940s or early 1950s. A key contention is that the existence of this organization and its activities are hidden behind walls of internal security from any and all elected and publicly accountable officials such as presidents, cabinet members, senators and members of congress. This secrecy is allegedly maintained by threats and intimidation. While some information does leak out, it is countered by the deliberate leakage of "disinformation" which masks the truth behind many seemingly related but false or partially false allegations. Some theorists believe that some of the information about these programs is released in a controlled manner to eventually prepare the public for a broader and more open disclosure of the real history of UFO studies. Did Canada have an active UFO study program in the mid-sixties? Did the Canadian government ever formally establish a policy direction concerning the potential national security implications posed by UFOs? While there has certainly been many UFO encounters involving RCAF aircraft and radar installations, there does not seem to exist a paper trail showing the policy direction that guided reaction to these events. The RCAF did perform some study of UFO incidents, but there is not any clear indication of the policy objective that framed this study. It is quite possible that the elected arm of the Canadian government, the PMO and cabinet, have never prepared a policy directive concerning the study of and response to UFO incidents. Perhaps there has never been sufficient pressure to require a government policy response. Perhaps government bureaucracy including National Defence has preferred to set their own internal policy. The media has largely ignored reporting of UFO events since the 1950s and the public is itself fragmented by differing belief systems and focussed on more tangible and immediate priorities. In Canada, the study of UFOs was offloaded to the National Research Council in 1968, the year that the US disbanded the USAF "Project Blue Book" study of UFOs. There were few scientists at NRC who harboured any willingness to show interest in the objective study of a "frivolous topic" like UFOs, except for the purposes of finding and locating fallen meteorites. The timing of the offload of UFO study responsibility suggests that Canada was simply following the US lead in its policy towards the study of UFOs. Since the mid 1950s, Canada has participated in NORAD which provides security of Canadian and US air space from foreign incursions. The response to any unidentified return that shows up on NORAD radar systems would abide by the policies and regulations established by the joint US and Canadian NORAD command structure. It is therefore quite likely that our response to UFOs detected by the military would abide by NORAD policies which are likely largely developed by US military strategists. It is theoretically possible that the US has actually discouraged Canadian government research into UFOs because they might be concerned that the results of such studies might be released to the public or may be obtained by competing foreign governments. It is difficult to catch Paul Kimball's line of reasoning on Hellyer. Apparently he sees Hellyer's disclosure that as a defence minister, he knew little or nothing about UFOs as proof positive that the Canadian government has never had an interest in UFOs. He might be right that most people in government were at most puzzled by what they heard. But there were certainly some people in the Canadian military that had to be concerned about what was reported by pilots and radar observers in various military encounters with UFOs. Kimball goes on to say "There was no super secret Wilbert Smith research project" in his efforts to debunk the notion that the Canadian government ever had any interest in studying UFOs. The project he is referring to is "Project Magnet", a program run by Department of Transport scientist, Wilbert Smith. The project was concerned with the idea that the earth's magnetic field might be the force used by the flying saucers for their propulsion. It later led to a small UFO detection station at Shirley Bay near Ottawa, Ontario. Project Magnet was funded by government from 1950 to 1954 and the UFO detection station was publicly funded from 1952 to 1954. 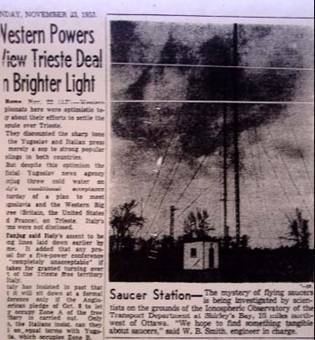 Although the project was supposedly secret, the UFO detection station was written about in several newspaper articles. It appears that publicity surrounding the station possibly contributed to the government's decision in 1954 to discontinue funding for the project. This photograph was published in the Toronto Globe and Mail, on the same day as a USAF F-89 disappeared after merging with a UFO on radar in Canadian air space over Lake Superior. Paul Kimball goes on to state "There was no secret plan to get an alien spacecraft to land in Alberta". I guess the point here is to disprove any notion that the Canadian military had any interest in the UFO phenomena. Here Kimball must be referring to the article printed in the Ottawa Journal in July 1967, "UFO Landing Site was 13 Year Secret". "Nothing ever materialized from that top secret project. No extraterrestrial flying objects ever sought to land on that 1000 square mile restricted tract of land over which no aircraft, civilian or military, was allowed to fly without special permission. The idea behind the classified project was that if any UFO tried to make contact with earth it could land at the DRB station without being shot down by defence interceptors." This Canadian Forces Base is located northwest of Medicine Hat, Alberta. For decades it was Canada's primary research centre into chemical and biological weapons. It is also alleged to have been designated as a top secret reserved "UFO landing site" back in the early 1950s. Yurko Bondarchuk refers to the alleged site in his 1979 book "UFO Sightings, Landings and Abductions – The Documentary Evidence". He revealed that Captain Douglas Caie, Public Information Officer from National Defence Headquarters in Ottawa stated regarding the alleged UFO landing site at Suffield "We have no record of any such program… From the information I have, we never had one." According to the 1973 book "Aliens from Space" by Donald Keyhoe, US Air Force intelligence learned of the restricted landing site at Suffield in 1954. According to Keyhoe, the site was established when efforts by the RCAF to "bring down" a UFO failed. The intent was to lure the aliens into landing but there was apparently nothing to indicate the area was reserved for alien machines. In the 1950s through to the 1970s, the experimental station at Suffield was Canada's main centre for research into chemical and biological WMDs (weapons of mass destruction). This included the testing of mustard gas and sarin on soldiers and other human test subjects. Suffield was also the primary Canadian test site for biological weapons such as anthrax, plague, ricin and botulinum toxin. It is also alleged that the RCAF has engaged in many pursuits of UFOs with its fighter jets since the 1950s. It is perhaps little wonder that the UFOs would not choose to land at a site controlled by Canadian National Defence which is devoted to chemical and biological weapons research. What was the source for this story? Why would the government designate a military base as a "safe landing site" for UFOs? What I have found quite interesting about this, aside from Kimball's denials, is the whole history of Smith as it relates to Canada's UFO studies of that period. While investigating this whole episode of the alleged UFO landing site at Suffield, I was quite surprised to find out that there might be a connection between this "bit of Canadian UFO fantasy" and our favourite UFO/ET proponent, Wilbert Smith. This story goes back to a UFO researcher named Grant Cameron. Through his interest of the alleged alien landing site at Suffield, he engaged Hellyer in a long period of correspondence with the purpose of locating certain information about the site. Grant Cameron wrote Hellyer several times in the 1970s, trying to determine the identity of the top defence department official who had revealed the existence of the secret Suffield "UFO landing site". Hellyer was never able to recall the name of the official, but told Cameron that he had searched his files at National Archives but was unable to locate his UFO file, which apparently contained notes from defence briefings on UFOs. The story does not stop there however. Cameron states that in 1978 he interviewed Wilbert Smith's widow and asked her if she remembered anything about the Suffield UFO landing site. In her version of the story, her husband had been making efforts to convince government officials that the aliens existed and that they should make efforts to talk to them face to face, to learn who they were and what they wanted. Canadian radio scientist and prominent "UFO Contactee" ran Project Magnet and UFO Detection Station for the federal government. Here the story begins to get very weird. In August 1954, the technology publication "Aviation Week and Space Technology" reported that Dr. Lincoln LaPaz was conducting a study of two "satellites" which had been recently discovered orbiting the earth at 400 miles and 600 miles above the surface. According to the article, the satellites had caused worries in the Pentagon as they were initially believed to be artificial. This was three years before the Soviet Union launched "Sputnik" the first human manufactured artificial satellite into orbit. The story was subsequently covered by several newspapers. Some people believed that the two mystery satellites were alien spaceships. One of these people was a Mrs. Frances Swan, who lived in Eliot, Maine. She claimed that beginning in April 1954 she began receiving channelled messages from the commanders of two alien ships orbiting the earth, AFFA who commanded ship M-4 and PONNAR who commanded ship L-11. For some reason or another, AFFA was the main alien contact for Swan and other contactees. 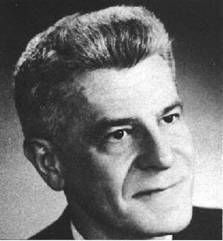 Wilbert Smith, who was a strong believer in aliens, maintained contact with Swan and other "AFFA" contactees. He also allegedly tried alternative methods for establishing contact with AFFA on his own or through various intermediaries. Mrs. Smith told Grant Cameron that Wilbert believed that if the government stopped shooting at UFOs, then he might be able to get spaceship commander AFFA to land for a meeting. Apparently AFFA had given this indication in a contact to Swan. Smith indicates that he approached a top secret committee in government to relay this request and they had agreed to allow AFFA a safe place to land. When Smith relayed this agreement back to AFFA, he was told that AFFA would also require assurances that he would also be free to take off without any interference. According to Cameron, Mrs. Smith told him that the top secret committee would not agree to this, and so the landing never took place. As weird as this story is, it is at least partially true. We know that Wilbert Smith was "a UFO contactee" and a "true believer" that some of the UFOs were spaceships flown by aliens. Mr. Smith really did receive government funding for his "Project Magnet" and the "UFO Detection Station" at Shirley's Bay. We know that Paul Hellyer did apparently reveal that Suffield Research Station had been designated as a top secret UFO landing site sometime back in the mid-1950s. His statement revealing this site was apparently made when he attended the official opening of the "UFO Landing Pad" in St. Paul, Alberta, which was a community project for Canada's centennial. From Mrs. Smith's telling, the aliens never landed because the Canadian government wouldn't consent to granting the commander permission to freely leave. What Hellyer was told and what was in his notes seems forgotten and lost with his vanished UFO file. The Suffield story seems to at least be partially true and it would be fascinating to know the complete real story behind it. From what we know sitting in our stuffy armchairs reading these stories and perhaps getting a good chuckle or two, is that AFFA and PONNAR appear to have left earth orbit, probably not impressed with the diplomacy extended by the Canadian government of that time. It is difficult to assess what impact Hellyer's comments have had on the Canadian public. I have had a few people mention to me that they had heard something about this, but they seemed largely unaware of any details concerning Hellyer's comments. The National Post published a column by regular political columnist Andrew Coyne. In his piece, "Holding Editors to Account", Coyne seems amazed by Hellyer's belief in a decades long government conspiracy to withhold secrets about UFOs from the public, and thinks this might mean that Hellyer has lost his marbles. He links Hellyer's "conspiracy views" with those of someone who believes the US government created the Islamist terrorist network that they are now fighting. Coyne proclaims his belief in factual reporting but calls on newspaper editors to be more selective and "exclude the obviously marginal". "There is a time and a place to debate whether the earth goes around the sun or the contrary, but we should have little time to address other matters if we were perpetually revisiting old controversies, or disproving every fantasy." I guess this explains why large media outlets almost never report any UFO unless it can be easily explained as a meteor. CLICK TO READ TORONTO STAR ARTICLE. It is a very rare event for any large media outlet to present any news relating to UFOs and alien visitation with a straight face. Discovery Channel did recently produce a satisfactory summary of the Exopolitics conference in Toronto but they prefaced it with a goofy cartoon UFO landing. Perhaps this was done to assure the audience that they were not intending anyone to take this in any way seriously. The same thing happens on CBC Radio anytime they have Chris Rutkowski providing reports from his annual survey of Canadian UFO events. It is always prefaced with yuk- yuk UFO alien jokes. I once heard an interview on "As it Happens" with an Indiana police officer who was witness to a huge triangular UFO that was seen by several officers in adjacent counties. The interviewer could hardly contain her smirking attitude while the officer tried his best to provide cool responses to her demeaning line of questioning. After the interview was concluded she was almost rolling on the floor in giggles as she said, "Pardon me, but I really have to wonder what it is that they put in the water down there!" It is hard to believe that such consistent disrespect can be dished out so casually by mass media outlets when it so clearly shows contempt for the views and beliefs of large parts of their reading, listening and viewing audience. The best that audience members can do when this bias and derogatory demeanour is displayed in the media is to complain to these media outlets. As long as the present climate of ridicule persists in the large media organizations, this climate will discourage any serious researcher from publishing material on UFOs and will discourage agencies from funding this research. Hellyer has stated his belief that elected governments have been largely excluded from information which is held within the bureaucracy about UFOs. He has in fact used his own experience to buttress this argument. How are our governments reacting to this presence? Are government agencies hiding information about UFOs from the public? Paul Hellyer is the perhaps the first former senior Canadian government minister to suggest that these questions are important policy questions and that the public has a right to be involved in the development of policy regarding the response of government to possible extra-terrestrial contact events. It is the duty of UFOlogists to seek truth and clarity in the reporting of UFO incidents. It is also our duty as citizens to seek the answers to the key questions posed in Exopolitics forums if we are at all open to the possibility that some UFOs may indeed be advanced vehicles fabricated and possibly piloted by beings from extraterrestrial civilizations. Mail a Free Letter to the Canadian Senate for public hearings on relations with ETs. UFO MAGAZINE: "Alfred Webre and the Politics of Exopolitics"
"Alfred Webre and the Politics of Exopolitics" by William J. Birnes, co-author of THE DAY AFTER ROSWELL. "Our human civilization is at the very beginning of its era of universal consciousness. Any factual errors in descriptions of the structure of a Universe government and of the dynamics of Universe politics, although they may be intuitively well founded, are the sole responsibility of the author." Who: Alfred Lambremont Webre, JD, MEd, author of EXOPOLITICS. What: The Exopolitics Initiative in the Parliament of Canada. on the Exopolitics Initiative now before the Canadian Parliament. From 1963-1967, Hon. Paul Hellyer was Minister of National Defence of Canada in the cabinet of Prime Minister Lester B. Pearson, who won a Nobel Peace Prize. On September 25, 2005, at the Toronto Exopolitics Symposium held at Convocation Hall, University of Toronto, former Minister of National Defence Hellyer, a supporter of ICIS’ Space Preservation Treaty to ban weapons and warfare in Space, stated: "UFOs, are as real as the airplanes that fly over your head," and "I'm so concerned about what the consequences might be of starting an intergalactic war, that I just think I had to say something." Hellyer went on to state: "The time has come to lift the veil of secrecy, and let the truth emerge, so there can be a real and informed debate, about one of the most important problems facing our planet today." Mr. Hellyer stated the Canadian people may be threatened with the consequences of war in outer space over our sovereign territory: "The United States military are preparing weapons which could be used against the aliens, and they could get us into an intergalactic war without us ever having any warning." Through the Canadian Exopolitics Initiative, the Government of Canada will undertake a 10 year process of formal, funded process of public education, scientific research, educational curricula development and implementation, strategic planning, community activity, and public outreach concerning our terrestrial society’s full cultural, political, social, legal, and governmental communication and public interest diplomacy with advanced, ethical Off-Planet cultures now visiting Earth. Whether you are a Canadian, or a world citizen (of any nation), you can take immediate action to help support the Canadian Exopolitics Initiative, by writing a Letter to the Prime Minister of Canada and the Chair of The Canadian Senate Standing Senate Committee on National Security and Defence. Please Cut & Paste This Letter Into Your Word-Processor. Print, Sign, Fax And/Or Mail (Postage-Free In Canada; Airmail Elsewhere) In Support Of Senate Of Canada Hearings On The Canadian Exopolitics Initiative (A letter in your own words is very powerful). Please send a letter each to Prime Minister Paul Martin and to Senator Colin Kenny. TODAY. On March 10, 2005 at a public hearing in Winnipeg, Manitoba, The Standing Senate Committee on National Security and Defence heard testimony and received a formal Proposal for a Canadian Exopolitics Initiative from the Institute for Cooperation in Space (www.peaceinspace.net). From 1963-1967, Hon. Paul Hellyer was Minister of National Defence of Canada in the cabinet of Prime Minister Lester B. Pearson, who won a Nobel Peace Prize. On September 25, 2005, at the Toronto Exopolitics Symposium held at Convocation Hall, University of Toronto, former Minister of National Defence Hellyer stated: "UFOs, are as real as the airplanes that fly over your head," and "I'm so concerned about what the consequences might be of starting an intergalactic war, that I just think I had to say something." He went on to state: "The time has come to lift the veil of secrecy, and let the truth emerge, so there can be a real and informed debate, about one of the most important problems facing our planet today." Mr. Hellyer stated the Canadian people may be threatened with the consequences of war in outer space over our sovereign territory: "The United States military are preparing weapons which could be used against the aliens, and they could get us into an intergalactic war without us ever having any warning." I request that the Parliament of Canada and Canadian Senate schedule public hearings on the Canadian Exopolitics Initiative, so that witnesses such as the Hon. Paul Hellyer, and Canadian-connected high level military-intelligence, NORAD-connected, scientific, and governmental witnesses facilitated by the Disclosure Project (www.disclosureproject.org) and by the Toronto Exopolitics Symposium (www.exopoliticstoronto.com) can present compelling evidence and testimony in support of this Initiative. I request that the appropriate Parliamentary Committees issue a public report following such hearings and urge you to approve a Canadian Exopolitics Initiative, as supported by the full weight of public evidence. Please put my name on your mailing list for updates on this important public issue. LISTEN NOW: Was the historical Jesus an Extraterrestrial/UFO contactee? CLICK HERE TO LISTEN ON QUICKTIME or to save MP3 to your hard drive: Was the historical Jesus an Extraterrestrial/UFO contactee? Caution: Short period of dead air between guest segments. TOPIC - Life in the Universe: This programme in Coop Radio's public affairs Life in the Universe series examines the socio-political implications of the Talmud of Jmmanuel and the Henoch Prophecies, in the context of the life work of "Billy" Eduard Albert Meier was born in Bülach, Switzerland on February 3, 1937. 1. Was the historical Jesus an Extraterrestrial/UFO contactee? The recent Heavenly Lights: The Apparitions of Fátima and the UFO Phenomenon (Ecce Nova) analysis of the Fatima miracle as a UFO-related phenomenon helps make that question a legitimate research issue in Exopolitics. 2. Should we pay public attention to a pattern of confirmed predictions of a possible human “Nightmare” scenario in our generation? A “Nightmare” scenario is an alternative future we can choose to avoid, if we are collectively aware of the “Nightmare” possible future. 3. What is the role of ethical Extraterrestrial Intervention in creating (1) human religion; (2) promoting World Peace? Conversely what is the role of unethical Extraterrestrial Intervention is destabilizing human society. 1. Permanent War Economy: One important public affairs issue in this programme relates to a possible future "Nightmare" global war scenario created by the Permanent War Economy, as set Meier-related Henoch Prophecies. PROGRAM QUESTION: Are a series of “Prophecies” related to the “Extraterrestrial contacts” of Billy Meier in fact an accurate depiction of some possible human “Nightmare” future? NEXUS Magazine, has published an article by the U.S. Media representative of UFO Contactee Billy Meier, demonstrating a threshold case that the Meier-related source was providing accurate information about a possible “Nightmare” human future in the event human society did not transform our of the permanent warfare economy. Because of the possible cataclysmic events apparently being accurately foretold, this version alone merits a further public inquiry. 2. Was the historical Jesus an Extraterrestrial/UFO contactee? "The Talmud of Jmmanuel (TJ),showing, largely through comparison with the Gospel of Matthew, that the TJ was the source for that gospel. The TJ informs us precisely which Matthean verses are genuine, which are partly genuine, and which are pure invention. In over 100 comparisons of parallel passages, the arguments pointing to Matthean dependence upon the TJ are seen to be difficult to reverse, and in all other instances the differences between the two are also consistent with TJ genuineness. Tests for TJ genuineness are indirect because its original Aramaic scrolls were destroyed due to their heresies, and only the German translation survived. From the TJ one sees that 19th-century scholars erred in assuming that Mark came before Matthew." This discovery occurred in 1963 as Swiss citizen and then world-traveler, Eduard Albert Meier, and his friend, an ex-Greek-Orthodox priest, Isa Rashid, were walking along a roadway just south of the Old City of Jerusalem late one afternoon. Meier happened to glance up the slope and notice a small opening in the ground amongst the rocks and shrubs. According to Meier's much later recollection in August of 1997, this hole was about 30 cm, or a foot, on a side. Being curious, he reached into his packsack for his flashlight and peered into the hole to notice that it continued inwards. So he and Rashid proceeded to dig away rocks and earth until the hole was large enough that they could crawl inside. It was an old tomb site, half filled in with earth. After further digging and exploring inside it they discovered, buried underneath a flat rock, a bundle which they took back with them to Rashid's abode; it was about 60 cm in length and 25 cm wide. The bundle turned out to contain the Talmud of Jmmanuel (or TJ) in the form of rolls of written sheets, along with a few small artifacts. They had been wrapped up together in animal skin which was in turn encased in resin, by then dry and crumbly, but recalled to have been black on the outside and yellowish-brown on the inside. There were four rolls, each of which contained many leaves or pages of Aramaic writing. They were obviously old and fragile but the writing was clearly legible. Meier recalls that each leaf was roughly 30cm by 40cm in size, or somewhat larger than the European AID A4 size of paper, which is 21cm by 29.4cm. He is not sure if they were made of very thin, translucent parchment or of papyrus. The Talmud of Jmmanuel, Chapter Chapters 3 and 4, depicts Jmmanuel (Jesus), following his Baptism by St. John the Baptist, as a UFO Contactee, who was willingly abducted by a UFO for the “Forty days and Forty Nights” set out in the New Testament version of the Life of Jesus (There are many alternate versions of the Life of the historical Jesus). “30. When Jmmanuel had been baptized, he soon came out of the water of the Jordan, and behold a metallic light dropped from the sky and descended deeply over the Jordan. “31. Consequently, they fell on their faces and pressed them into the sand while a voice from the metallic light spoke. 33. Behold, after these words Jmmanuel entered into the metallic light, which climbed into the sky, surrounded by fire and smoke, and passed over the lifeless sea, as the singing of the metallic light soon faded away. PROGRAMME QUESTION: Was the historical Jesus an Extraterrestrial/UFO contactee? LISTENER-SPONSORED CO-OP RADIO is broadcast across Canada on the Star Choice satellite system on channel 845. Co-op radio, CFRO fm is located in Vancouver, B.C., Canada. Its frequency in the Vancouver area is 102.7 MHz and we are also found on various cable frequencies in most major cities throughout British Columbia. Listener phone-in: Call Coop Radio on-air with your questions and comments at (604) 684-7561. Note from a Friend:"Popularity of Exopolitics"
'All truth goes through three stages: First it is ridiculed. Then it is violently opposed. Finally, accepted as self-evident.'" Ontario's Best Lecturer - Finale! "We're looking for a different kind of idol. "10 lectures. 5 weeks. Reality TV with a high IQ. "The search concludes in our quest for a different kind of idol! "You just have to just trust us that the first lecture of this weekend's program is a very good one. After all, it is the winning lecture in our first Best Ontario Lecturer competition. The news about who won has been embargoed until Irshad Manji introduces the winner to you this Saturday at 1:00 PM. It's just like the Oscars sans the red carpet. What's at stake? The university of the winning professor will be presented with a $10,000 TD Meloche Monnex scholarship. It was a squeaker of a finish and so there is room to disagree with the choice. If you feel that way, let all of us know on our discussion forum. "And we wouldn't be surprised if some of you did not want to share with others your reactions to our second lecture. It's a talk by Canada's former Defence Minister Paul Hellyer, which he delivered this past September at a day-long symposium on exopolitics. Exopolitics is the new conceptual face of UFO aficionados and Paul Hellyer came to lend his hand to the cause". Say what you want, but Mark Kingwell the University of Toronto philosophy professor has a knack for communicating ideas reasonably and intelligibly ... and he enunciates with the best of them. If you don't know of Mark Kingwell -- and even if you do -- you are in for a treat as he is reading from Nothing for Granted, a collection of essays which were previously written for the National Post. Read "Paul Hellyer & the Politics of Exopolitics: Former Canada Defence Minister: US is developing weapons systems for space which are to be used against ET craft entering earth's airspace." Read the book that has been strongly recommended by Canada's former Minister of National Defense, Hon. Paul Hellyer, during his historic speech at the Toronto Exopolitics Conference in September 2005.